Some time ago in Australia I came across an exciting hands-on development project that empowers people in Mali, one of the poorest countries in the world. The project is not only run by inspiring young Australians, foremost lovely Elise, but it is also a perfect match to my desire to make a difference in the field in Africa. The project has established a successful pilot in a village by building a school and establishing a small Microfinance group near the capital Bamako. The people driving the project, Youchaou Traore in Mali and Elise in Melbourne, have big dreams. Every hand and dollar are needed, therefore, I have joined the team and we will travel to Mali and East Africa in December for some months. Therefore, I will increasingly introduce Mali and the Mali Project as well as our plans and work on this blog. Also check out the Mali Project website. 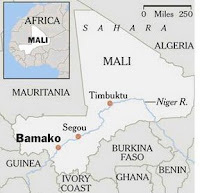 Mali is a landlocked country located in West Sub-Saharan Africa as shown in the map above. It has a population of about 11,9 million people growing at a high rate of 2.7%. 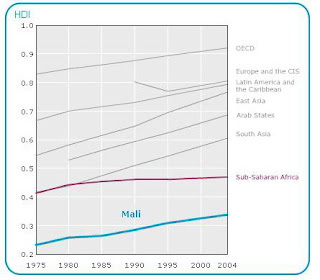 The median age is just 16 years and over 48% of Malians are between 0-14 years old. Historically, Mali was a French colony and got its independence in 1960. The first President ruled the country for eight years and a military Coup in 1968 that established a dictatorship until March 1991. A revolution then threw down the dictator and Mali became a democracy. Since the events of March 1991, Mali is committed to the establishment of a democratic society which requires access of all citizens to a minimum education. The legacy of 33 years of dictatorship has been responsible for severe poverty and under-development, especially a lack of health and educational facilities. Mali is one of the poorest countries in the world ranking 175th out of 177 countries with data in the United Nations Development Index 2006. With a per capita GDP of less than 1000 PPP US$ and an illiteracy rate of 81%, most of Malian communities live in extreme poverty lacking basic resources such as access to food, water, shelter and health facilities. As the World Health Organization reports, the health indicators are alarming which will be analysed in the following section of development needs. Despite some progress, Mali has a Human Development Index (HDI) which remains starkly below the HDIs of other regions in the world. The HDI measures three dimensions of human development: 1) life expectancy), 2) literacy and school enrolment and 3) Income measured by purchasing power parity. The Mali Project is very exciting, so stay tuned for more updates!